Oh, noes!!!!!! No more boolits? No. There might be a ban, but it's not that bad. Really. After President Obama and his Democratic colleagues in Congress failed to accomplish their anti-gun agenda through the legislative process, they’re now turning to the only other avenue left to them: executive action. And the popular AR-15 looks to be the most significant casualty. but this story is full of hyperbole like that. Up in the holler I'm from, this article would be called "a pack of lies". 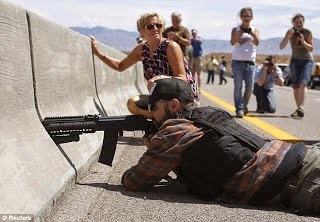 Get it straight, people: the Obamites are NOT banning all .223 or 5.56 mm ammunition. They are not banning possession of anything (in fact, Ol' Backwoods himself got that wrong the other day). 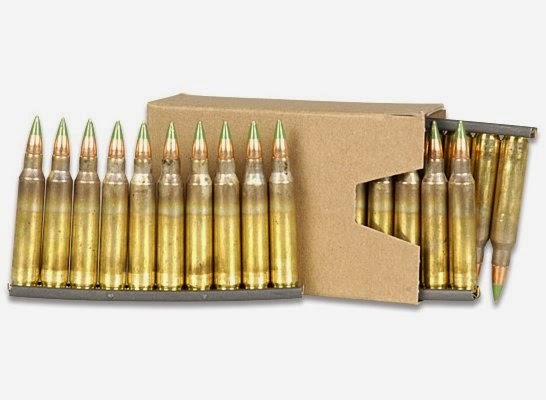 The ATF has proposed the ban on manufacture and sale for civilian use of military-surplus ammunition, containing a 62-grain projectile (bullet) with a steel penetrator in front of a lead core, referred to by the military as M855, also called SS109 . Look, it's not any more armor-piercing than any other 5.56mm bullet is; at 3000 - 3500 feet per second, almost ANYTHING pierces soft body armor. Regardless, there's no reason under the stupid "Cop Killer" Boowits law (which Reagan signed) to ban it, because M855 has a lead core. Maybe we can beat this ban back, and maybe we can't. But articles like this are causing people to think all AR-15 ammo is banned, and they freak out and buy up any 5.56 ammo they can get like there is no tomorrow, causing shortages for months and months to come. THIS IS STUPID, PEOPLE! Get a grip on reality! There's still time to comment to the ATF. There's a petition on WhiteHouse.gov that even Ol' Backwoods signed. What's that? Don't want to end up on a "government list"? Hey, we're ALL already on a government list, called "Form 4473s". What's another? --Noah Webster in `An Examination into the Leading Principles of the Federal Constitution', 1787, a pamphlet aimed at swaying Pennsylvania toward ratification, in Paul Ford, ed., Pamphlets on the Constitution of the United States, at 56 (New York, 1888).